Will the Clark County Family Court Intervene if Two Parents Disagree on Medical Decisions? This is the next post in my series discussing which issues the Clark County Family Court will and will not rule on when it comes to parents who share custody but cannot agree on major parenting decisions. My last post provided insight into how a Court will deal with educational disagreements. In this post I will explain what happens when two Las Vegas parents do not agree on what medical decisions to make for their children. 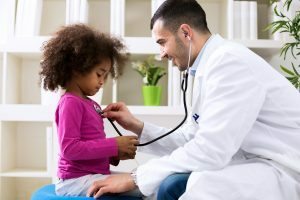 While it may seem obvious that both parents will strive to give their children the best medical care available, differences in belief systems, lifestyle, and religious affiliations can put parents at odds when it comes to making medical decisions. Parents may disagree over issues such as vaccinations, surgeries, medical interventions, or even something as simple as a child’s diet. While the number of scenarios that could occur are too numerous to discuss then the basic rule of thumb is that the more elective a medical choice then the less likely the Court is to hear the case. The less elective a medical decision is then the more likely the Court is to mandate the child have a procedure. For example, if parent A does not want their child vaccinated due to personal beliefs and feelings around vaccinations, and parent B does want their child vaccinated due to common medical practices, then the Court will consider whether or not the vaccinations are mandatory. If the school district the child attends mandates that all children be vaccinated in order to go to school, and the only exceptions are factors that do not apply to the child, then the Court will likely side with parent B. Another way to think about medical decisions is if a child will be injured or harmed by not having a medical procedure. For example, if parent A does not wish to give their child cold and flu medicine, and instead wishes to treat the child ‘naturally,’ so long as the child recovers and is not harmed in some way a Court will likely not intervene. However, if a child were gravely ill, and parent A refuses to seek medical treatment, parent B could argue that medical neglect is occurring, file a report with Child Protective Services, and file a Motion for an emergency intervention. The more life threatening a medical situation is then the more likely the Court will intervene. The Court will not intervene in issues that are not seen as significantly harmful to a child, or simply a difference in parental lifestyle. For example, if parent A wishes for their child to only eat organic food, or to be raised as a vegetarian, parent B cannot be forced to comply with this request. The Court will not get involved with issues surrounding diet choices, vitamin supplements, elective health and mental health treatments, etc. unless there is some compelling medical reason why it is necessary for a child to have such treatment. For example, the Court would be unlikely to get involved with issues having to do with diet. However, if it can be proven that the child suffers from Celiac disease, and that the other parent’s refusal to follow the child’s dietary needs is causing significant damage, then the Court may consider intervening, ,depending on the facts of the case. If your child has a medical concern and you are worried that your co-parent is not taking it seriously then you may or may not have legal options. Contact our office today to speak with a Las Vegas family law attorney.